Scooby Doo Curse of the Lake Monster was just on the Cartoon Network and I sat and watched it with my kids. It was a great time hanging out with all the kids, but the movie itself was entertaining on one hand, yet disturbing on the other. I mean, when Shaggy talks all weird in the original cartoon, everything seems cool. But watching a real person talk like that for 2 hours was… well… a bit annoying. Regardless, we’re able to hang out and watch the movie and had a great time. 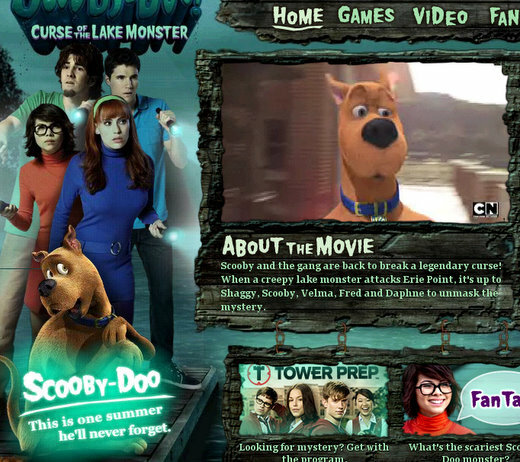 What do you all think of Scooby Doo Curse of the Lake Monster? I am a fan of Scooby Doo and I felt like it didn’t show enough Scooby! His name is in the title!! The only part that really made me laugh was the beginning when Shag and Scoob were hula dancing. The movie went downhill really fast after that. The last movie was the best (The one where Scrappy is the culprit) Plenty of old fashioned Scooby humor. This was missing the zany, zippy, zappy funny comedy that only Shaggy and Scooby can bring. It Was Not There. Most of the film Scooby was not even there. I knew it was going to be Velma when she held that stone for the first time and felt sick. It was soooo obvious. Plus she was never around when the monster was attacking. The movie gave no other suspects since everyone got scared and ran away. One more thing- What was up the waitress in the restaurant!! Wasn’t everyone supposed to be gone. Sorry one-one more thing-Please give Fred back that delicious blond hair! !